Imagine that long before you actually needed help, there was someone waiting to lend a hand. Or, in the case of service dogs, a paw. 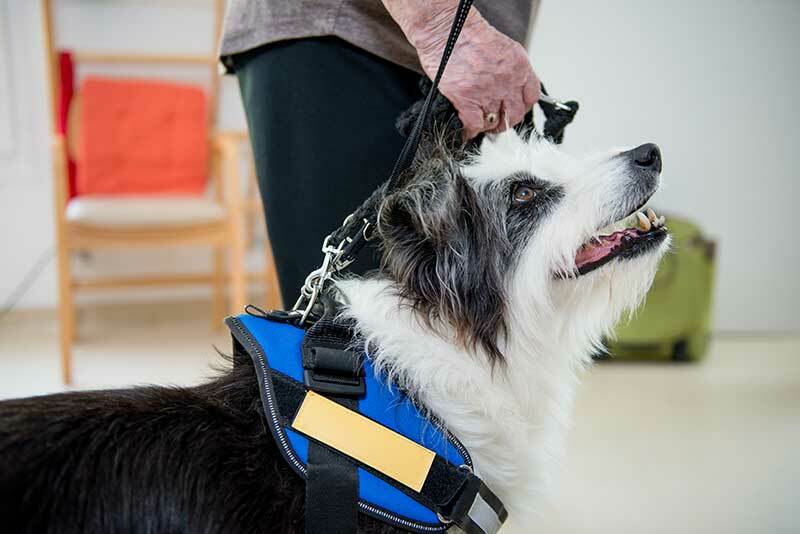 Anticipating the needs of the owners/handlers, these highly-trained animals are not only amazing at their jobs, they’re downright necessary for people with disabilities or significant health issues. You’ve probably seen one of these life-saving dogs in public before, but it may surprise you to learn that there are many different types, all with their own skills, legal protections, and privileges. The Americans with Disabilities Act (ADA) protects handlers and their service dogs from discrimination. In fact, they are allowed entry into all buildings, facilities, and businesses (even those with “no pets” policies) without restriction. If they are stopped, asked to leave or to furnish documentation, the handler can file civil charges against them. The ADA website is a great resource for learning more about service dogs. Service dogs are those specifically trained to carry out tasks for their handlers. They are the only dogs protected under the ADA and include K9 dogs, fire dogs, search and rescue dogs, police dogs, seeing eye dogs, hearing dogs, and assistance dogs. Any breed can be trained as a service dog, but you may commonly see German Shepherds, Gold Retrievers, Border Collies, Labrador Retrievers, and Beagles. These animals give their handlers security and independence. Without having to rely on other people to help them, handlers also develop a strong bond with their dogs. Emotional support dogs offer comfort and security to those suffering from various illnesses like bipolar, depression, anxiety, and others. Since they aren’t specially trained, they aren’t protected by the ADA. However, they can usually accompany their handlers on airplanes without extra fees, and help their people acquire housing that’s advertised as “no pets allowed”. Therapy dogs are well-trained companion pets that visit nursing homes, hospitals, classrooms and more. Proven to reduce stress, provide comfort, and raise happiness, therapy dogs have a special place among kids, seniors, and those that are ill or recovering. Service dogs can be bred and trained by anyone, but the most reputable organizations will be accredited through the Assistance Dogs International. Their policies assure that the dog training and care met very high standards prior to adoption (usually after a dogs’ 2nd birthday), and the price of the dog often reflects that. Training can be a lifelong process, and many dogs benefit from opportunities to hone their skills. The pet experts at Springbrook Animal Care Center appreciate all the hardworking dogs out there. They truly make the world a better place! As with anything related to pet care, if you have any questions or concerns about service dogs, please contact us.